← 1755 – changes on the Holy Mountain? 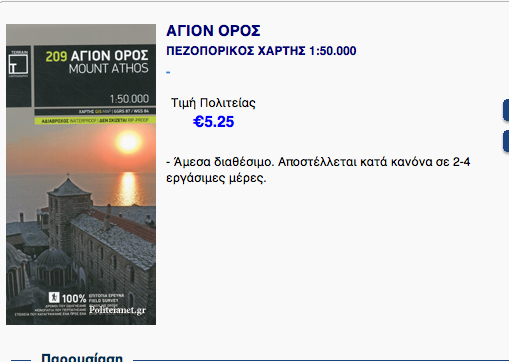 There is a new map Mount Athos available . 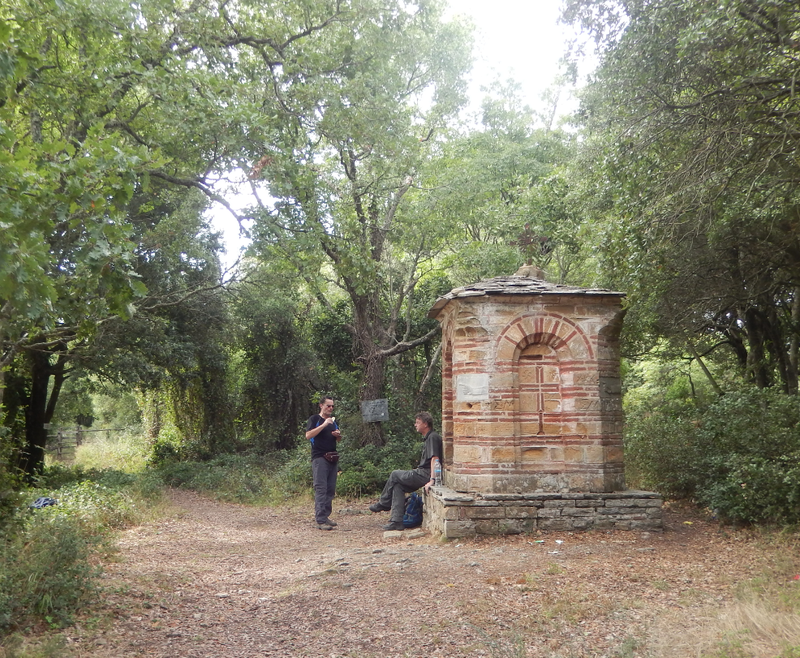 Water- and rip- proof and The first highly accurate map of Mt Athos as is it stated on the map. This last part is not true because the first accurate map of the Holy Mountain and still the best is the so called Zwergermap. But I have to say this map is not bad at all and together with the Zwergermap it is very usefull when walking the paths and roads. It has good extra maps of Karyes and the Karyes area. 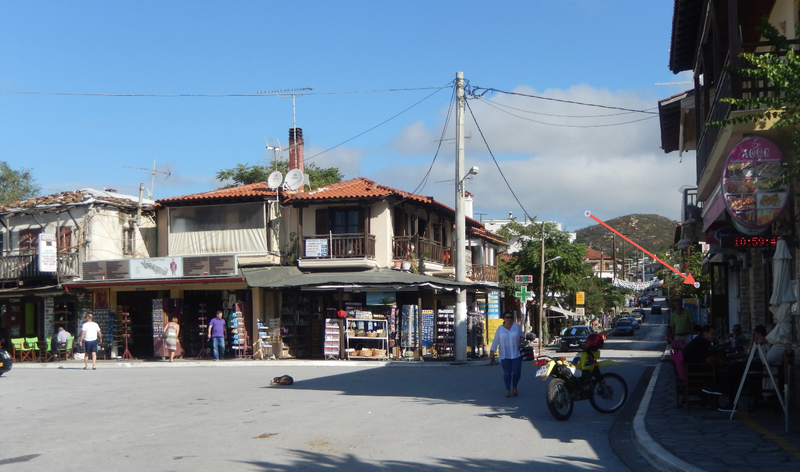 Besides, the map is not expensive EUR 5,25 on the internet and EUR 7,50 in the shop in Ouranoupolis. In this shop at the square in Ouranoupolis you can buy the new map. The map by Zwerger is not for sale in Ouranoupolis, to expensive according to the shopholder. So buy the Zwerger map on the internet. 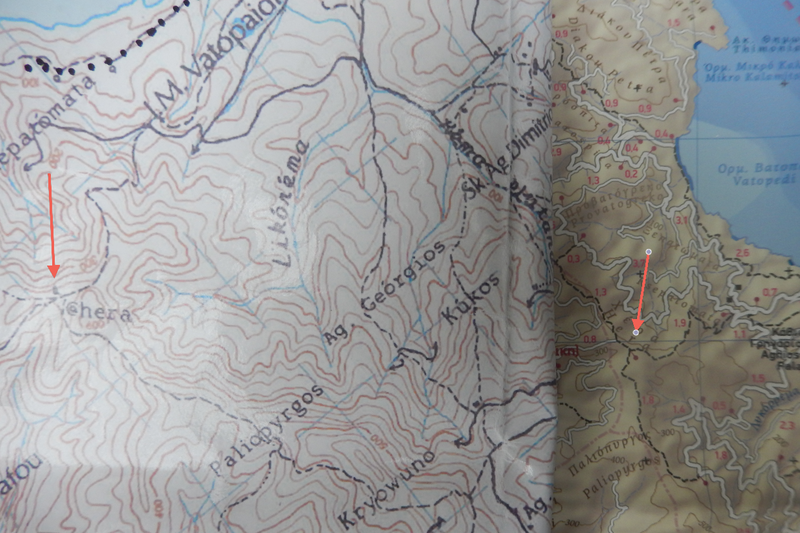 On the left the map by Zwerger (not the latest edition) and on the right a detail of the new map. The arrow points on both maps to the crossroad Chera. But on the new map there are only 3 footpaths to be seen. In fact there are 4 monopatia coming together at this spot as we as we experienced on our last trip in september 2015. 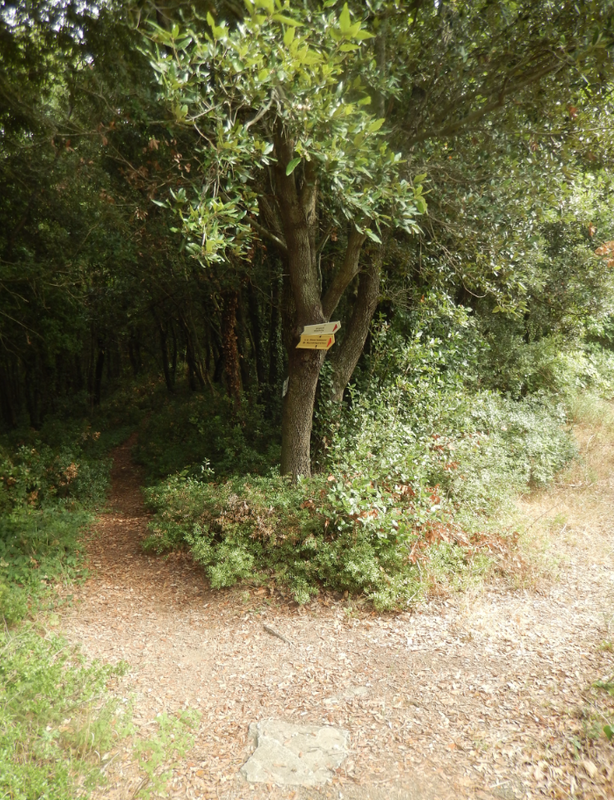 This is the Chera crossroad where we rested after climbing 350 meters coming from Vatopedi. After this pause we will continue our walk heading for Sografou. Chera means hand. 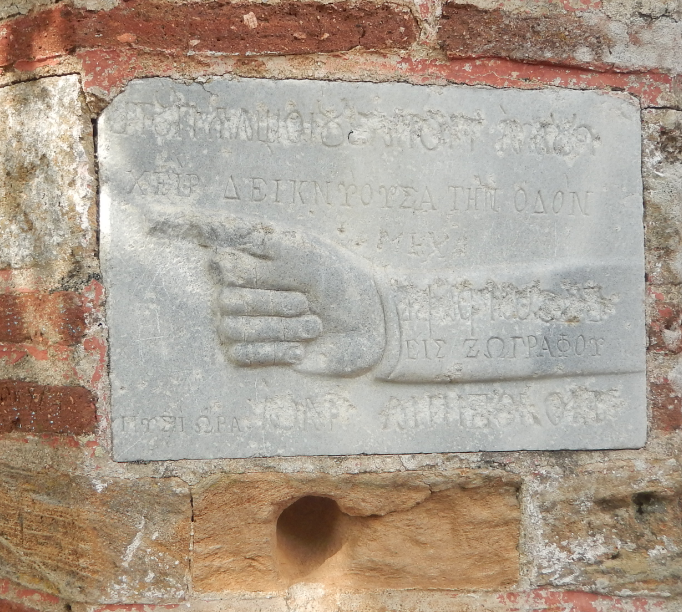 One hand is pointing to Sografou, the other to Vatopedi. 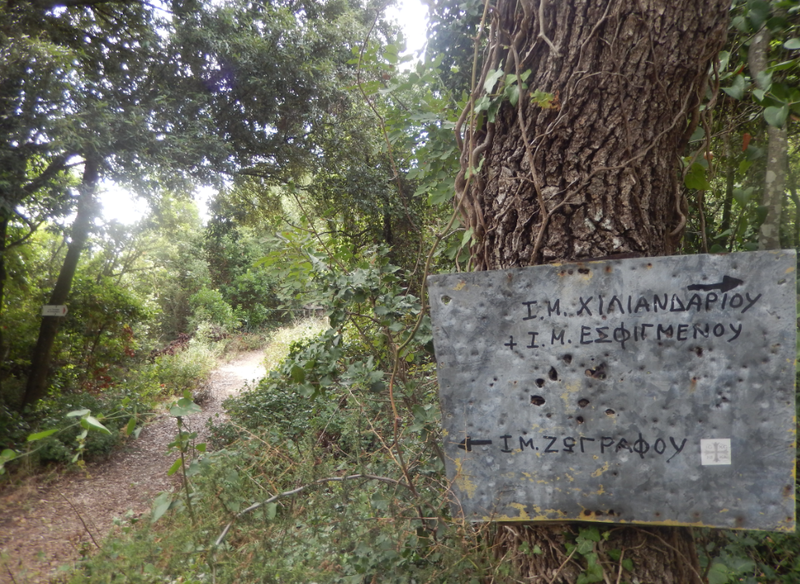 But there two more opportunities, following the ridge of the peninsula to Chilandariou/Esfigmenou or to Karyes. The signs in all 4 directions. The cross on the crossroad. 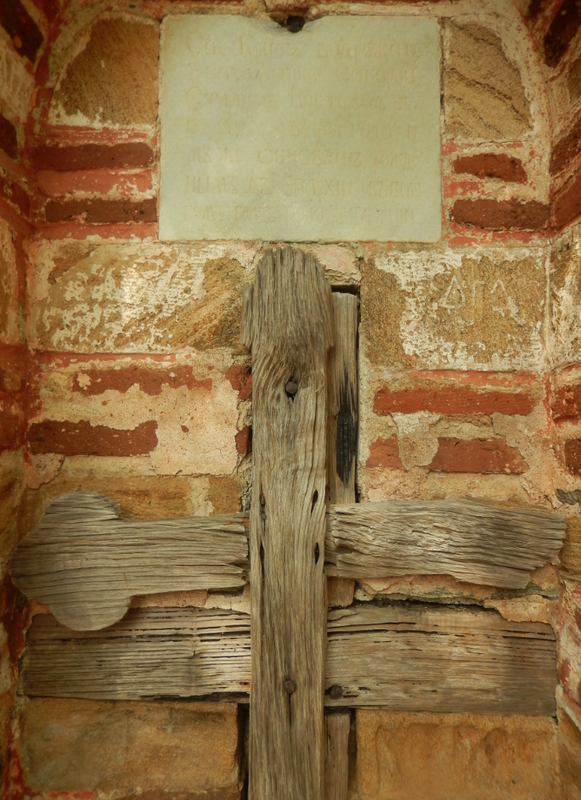 “This Cross is mounted by Zograf’s elder Victor in 1851 and is updated by him and by who was born in eparhy in the Great city of Tarnovo (Veliko Tarnovo)”. This entry was posted in basic information/reservations, maps, walking and tagged Chera, monopati, zwerger. Bookmark the permalink. 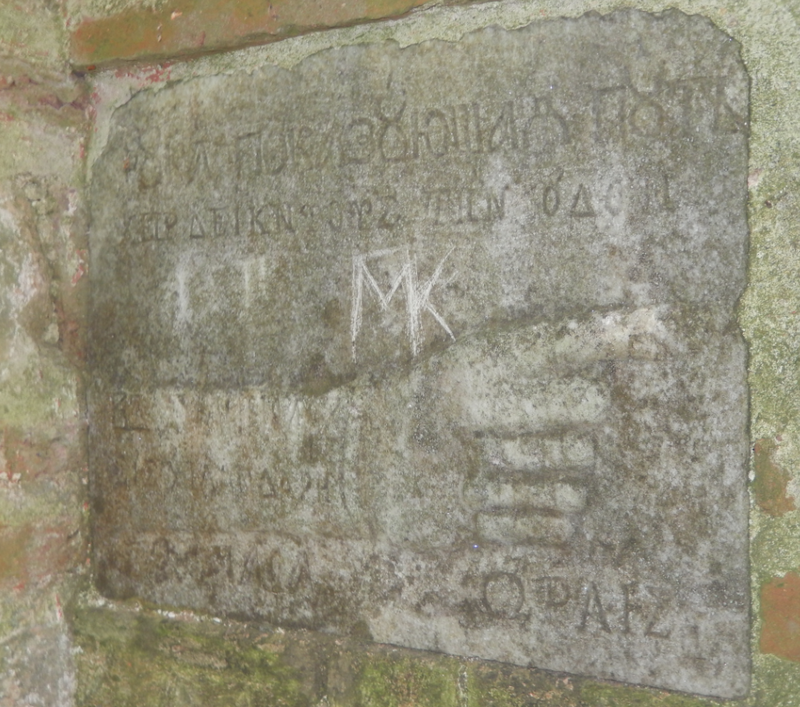 The link to the text on the Chera monument is dead (a 404); can you please fix it ? Geen link maar de gedetailleerde foto van de tekst ontbrak. Nu hersteld. Kan je het lezen? Ik zal m’n best doen, maar ik moest eerste wat knutselen in Photoshop om de letters duidelijker te maken. 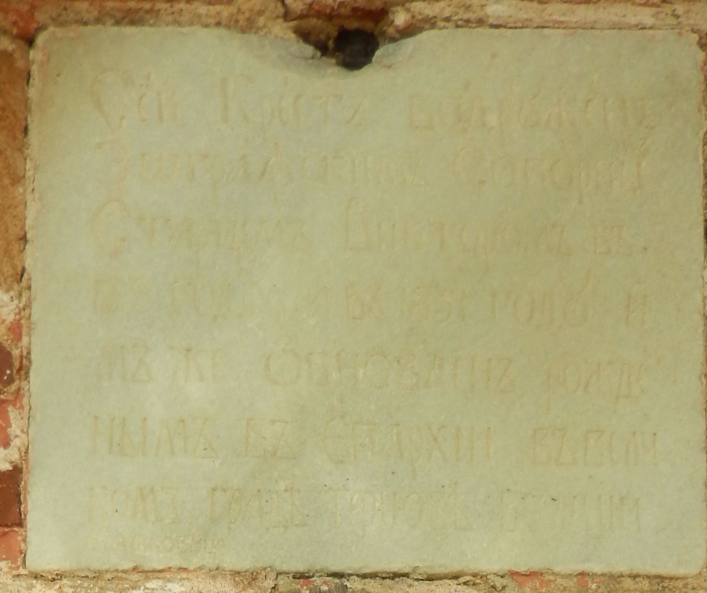 This text is on the Chera crossroad monument. Can somebody read and translate it? Complimenten met je schitterende blog, meer een heel uitgebreid reisverhaal. Via welke site is de nieuwe wandelkaart van Athos verkrijgbaar? Een Websearch levert niet veel bruikbaars op.